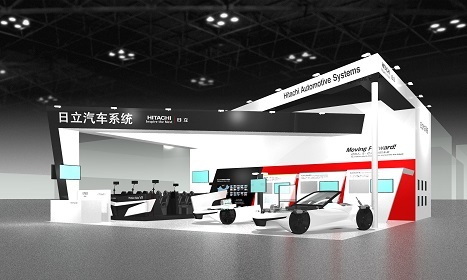 Tokyo, April 8, 2019 --- Hitachi Automotive Systems will exhibit at Auto Shanghai 2019 - The 18th International Automobile Industry Exhibition, which will be held from Tuesday April 16th to Thursday April 25th in Shanghai, People's Republic of China. During this exhibition, the company will exhibit a wide range of automotive technologies and products that will support the next generation of advanced vehicles, with a focus on technologies for electrification and autonomous driving. The theme of the exhibits will be Moving Forward! To a Future Linking People, Cars and Society. In addition to "electrification technology" such as motors and inverters, there will also be exhibits of "360° sensing technology" to detect the surrounding situation by combining peripheral recognition sensors such as cameras and radars, and "safety control technology" such as chassis products and control units that control the vehicle based on the information detected. An autonomous driving system realized through the coordination of these technologies will be fitted to a showcase car for a virtual display combining actual equipment and video footage. The autonomous driving technology of the Hitachi Group can be experienced in the eight-person VR Ride Theater with a realistic 360° three-dimensional image. When wearing the headset, visitors can enjoy the powerful travel scenes of the autonomous driving of the future.